You know a song is popular when people make parody music videos. Singers Robin Thicke, T.I., and Pharrell Williams have one of (if not the) most played songs of the summer called Blurred Lines. You can’t drive anywhere listening to the radio without this playing at least once. For your knowledge (and enjoyment), I have embedded the parody video of Blurred Lines from the Tampa Bay Buccaneers cheerleading squad featuring the Muppets (the Tampa Bay Buccaneers video was taken down from YouTube). Just like Carly Ray Jepson’s Call Me Maybe was parodied thousands of times, I am sure this song will be as well. Now to the point of this article. The BlurredLines.com domain name is owned by Huge Domains. It was originally registered back in 2010, well before the song hit the radio. 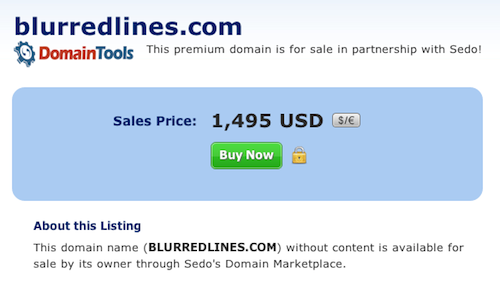 Huge Domains is selling BlurredLines.com on Sedo for a relatively inexpensive $1,495. I am surprised to see it selling at such a reasonable price, especially considering the price of GangnamStyle.com. I am not going to touch on the possibility of trademark issues or ways to use / monetize the domain name. It’s probably a domain name you’d want to speak with an attorney about before buying though. Which link? I just clicked the Sedo link (not an affiliate link) and the listing is still there. Ahh… guess the video was taken down from YouTube. wow have you seen the NSFW video . Holy cats! That’s a great bargain ..